Sample is 3/4-by-2 1/4-inch square-edge solid strip. Color: Hickory heartwood is tan or reddish; sapwood is white to cream, with fine brown lines. Grain: Hickory is closed, with moderate definition; somewhat rough-textured. Variations Within Species And Grades: In both hickory and pecan, there are often pronounced differentiations in color between spring wood and summer wood. In pecan, sapwood is usually graded higher than darker heartwood. 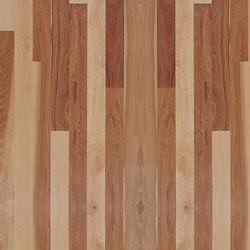 Pecan and hickory are traditionally mixed by flooring mills. Dimensional Stability: Below average (change coefficient .00411; 11% less stable than red oak). Durability: Combination of strength, hardness, toughness and stiffness found in no other commercial wood; exceedingly high in shock resistance. Sawing/Machining: Hickory species’ density makes it difficult to season, machine and work with hand tools. Sanding: Difficult to sand because of density, and because light color makes sander marks show more than on darker woods. Nailing: Good holding ability; prone to splitting. Readily available from specialty wood flooring dealers, although parquet not commonly available.